Music is an important part of the life of our church. Our Interim Director of Music Ministry, Marques J. Ruff, plans music for worship services and also directs the UU Sanctuary Choir. We are also blessed with many members who are talented musicians and singers and who willingly share their musicianship in our services and at other church gatherings with solo or ensemble performances. Our services normally include a number of musical elements, including an opening prelude, two or three hymns from our hymnal Singing the Living Tradition, offertory music, a sung closing benediction, and a postlude. 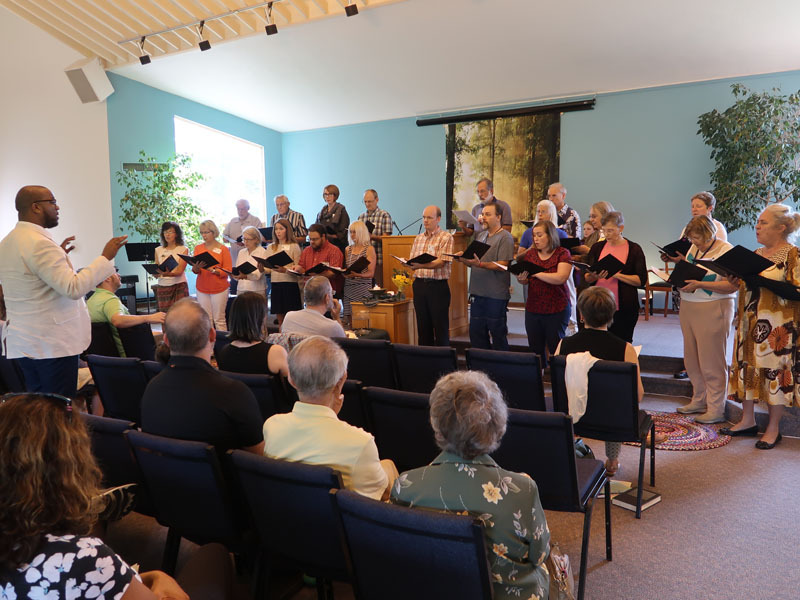 Our talented UU Sanctuary Choir performs regularly during the regular church year from September through May. They rehearse at the church at 7 p.m. Wednesday evenings and on the Sunday mornings before they perform. Sam Otten on piano, Alan Arnold on saxophone and Sam Buffaloe on drums.